Exquisitely detailed map and view of Recife, Brazil. Das Norder Theil des Lands Brasilien. This is a stunningly engraved 1655 Matthaeus Merian map of the coast of Brazil and a view of Olinda and Recife in Pernambuco, Brazil. The inset map, shown as if being unrolled on a piece of parchment, shows the coast of Brazil, and more specifically the Capitania de Pernambuco. The cities along the coast are labeled, as well as the rivers. There is a beautiful compass rose to the bottom left of the inset as well as a scale. The map, however, is dominated by the view of Olinda and Recife. This view depicts the siege of Recife and Olinda in 1630. 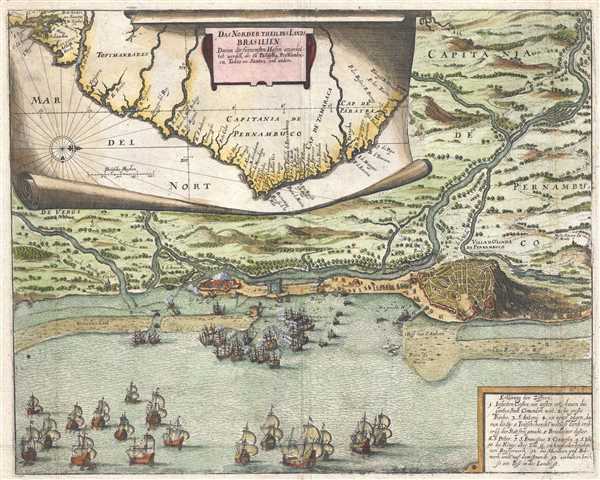 This siege was a part of a larger war between Dutch forces, meaning the Dutch East India Company and the Dutch West India Company, against the Portuguese. In North America, the Dutch West India Company had established New Netherlands and New Amsterdam to further expand their trade empire. Eventually, hostilities would resume between the Dutch and the English, which were connected to events in Recife, and the English would conquer the Dutch colony of New Amsterdam and rename it New York. The Dutch-Portuguese War revolved around trade, and that meant sugar in the West Indies and South America. The Dutch had tried to conquer Recife once before and failed. This engraving depicts their successful return and the beginning of their conquest in Brazil, although that conquest would be relatively short-lived, lasting only about 15 years. The view shows dozens of ships off the coast, some of which appear to be bombarding the coast. Several battalions of soldiers are shown on the coast, carrying rifles and Dutch flags. One of the coastal towns is ablaze. The topography of the land is depicted as well, along with trees and rivers. At the lower-right corner, a list of specifically-identified locations is given, allowing the viewer an even more precise understanding of the events taking place. This map was created for Johann Ludwig Gottfried's Newe Welt und Americanishe Historien, which was published by Matthaeus Merian and was an abridgement of Theodore de Bry's Grands Voyages. Merian,M., Newe Welt und Americanishe Historien, (Frankfurt) 1655.